Written by CMOS Bulletin SCMO on June 5, 2018 . Posted in Weather, What's Current. 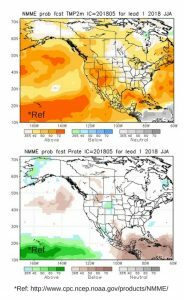 Seasonal Outlook (June, July, August) for 2018 temperature and precipitation in Canada includes above normal temperatures across southern Canada, and below normal precipitation for the western and central Prairies. The highest probabilities (70% and +) for above normal are over the southwestern BC and the Maritimes. Over AB, western SK and western QC there is also high probability of more than 60% for an above normal summer. Northern parts of Canada have a very high probability for below normal JJA reaching more than 80% chance over the Hudson Bay region. Below normal precipitation is expected over the western and central Prairies. The highest probabilities of ~60% or more are expected over southern AB. Central AB and southwestern SK also have a probability of ~50% for below normal precipitation. Central and western BC and most parts of the Maritimes have a ~40% chance for below normal JJA. Most other parts of Canada have equal chances for above/near/below normal precipitation. What will influence the next season? ECCC predicts weak El Niño to develop in JJA18 and to persist in the following autumn. According to the longer lead seasonal forecast issued by IRI, there is a probability of slightly less than 70% that the neutral conditions will prevail this summer. Both NAO and PNA indices will likely stay negative until mid-June, (according to the CPC) after which the skill is low. There is a high agreement between the forecasting centers about the below normal precipitation probabilities this summer in the western Canada and western Prairies. This precipitation signal is strongly correlated with increased probabilities for above normal temperatures over the same locations. Therefore, we suggest a drought watch and a forest fire increased awareness in these regions for the summer 2018. Temperature: There is a difference between CanSIPS and a longer lead (1 month) forecast from NMME, especially over the Northern Canada where NMME is suggesting above normal temperature probabilities. Over the central Canadian Prairies, NMME is showing near normal or equal chances for temperature this summer. For other parts of Canada, NMME forecast is in accord with the CanSIPS showing a probabilities for above normal summer. Precipitation: According to the NMME (on the bottom figure) there is >40% probability of below normal precipitation over southern and central parts of AB. This also in accord with the precipitation forecast given by the International Research Institute. 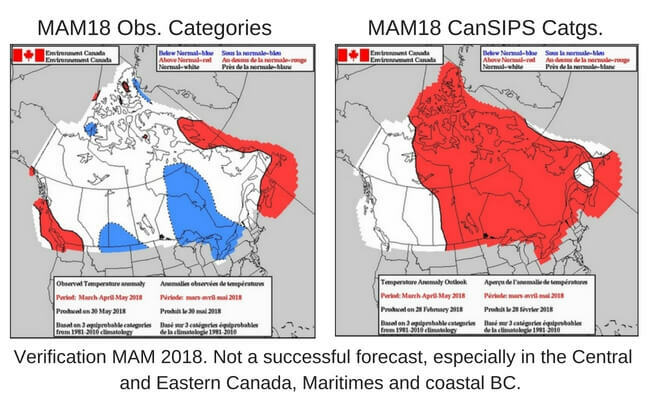 Elsewhere in Canada, NMME is suggesting equal chances for the three precipitation categories.